To check out three sample essays, click the images or links to the right. 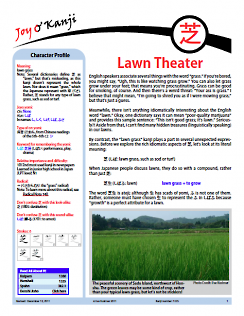 "Monkey Business" and "Lawn Theater" are from Joy o' Kanji's beginnings. Reading those writeups in that order is particularly useful if you want to see how essays build on each other. (Plus, who can resist a monkey?!) "Fanfare" is much more recent and really shows what Joy o' Kanji essays have become. JOK Notebook blog posts, Radical Terms, Radical Notes, the glossary, and Thematic Explorations. The table of contents for essays, which lets you know which essays are available for purchase and takes you to the Character Home Pages for all Joyo kanji. The sample JOKIA album on 酒 (alcohol, saké), which demonstrates what JOKIA (Joyo Kanji in Action) photo albums have to offer you. Check out our low prices. Register with Joy o' Kanji by using the forms below. Registration is free and does not commit you to buying anything. Receive email notifications of new content posted to this site. Notifications are sent every 15 min. 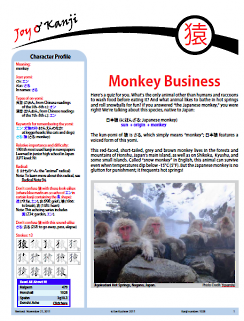 Yes, I want to be on the Joy o' Kanji mailing list, receiving newsletters about the latest additions to the site. This is the most important question. The Great Wall of Kanji will display your favorite kanji. You can change your favorite kanji at any point. After all, love is fickle! Please write your favorite kanji here. Type the actual character if you can. And then add the meaning in English. E.g., 猿 (monkey). The following are terms of a legal agreement between you and Joy o' Kanji. You acknowledge that you have read, understand, and agree to be bound by these Terms and Conditions of Use and to comply with all applicable laws and regulations. If you do not agree to these Terms and Conditions of Use, you may not use the Joy o' Kanji website (the "Site"). All text, graphics, user interfaces, visual interfaces, photographs, trademarks, logos, sounds, and artwork (collectively, “Content”), including but not limited to the design, structure, selection, coordination, expression, “look and feel” and arrangement of such Content, contained on the Site is owned by Joy o' Kanji, and is protected by applicable intellectual property laws and other laws. You may not use any “deep-link”, “page-scrape”, “robot”, “spider” or other automatic device, program, algorithm or methodology, or any similar or equivalent manual process, to access, acquire, copy or monitor any portion of the Site or any Content, or in any way reproduce or circumvent the navigational structure or presentation of the Site or any Content, to obtain or attempt to obtain any materials, documents or information through any means not purposely made available through the Site. Joy o' Kanji reserves the right to bar any such activity. You may not attempt to gain unauthorized access to any portion or feature of the Site, or any other systems or networks connected to the Site or to any Joy o' Kanji server, or to any of the services offered on or through the Site, by hacking, password “mining” or any other illegitimate means. You may not probe, scan or test the vulnerability of the Site or any network connected to the Site, nor breach the security or authentication measures on the Site or any network connected to the Site. You may not reverse look-up, trace or seek to trace any information on any other user of or visitor to the Site, or any other customer of Joy o' Kanji, including any Joy o' Kanji account not owned by you, to its source, or exploit the Site or any service or information made available or offered by or through the Site, in any way where the purpose is to reveal any information, including but not limited to personal identification or information, other than your own information, as provided for by the Site. You agree that you will not take any action that imposes an unreasonable or disproportionately large load on the infrastructure of the Site or Joy o' Kanji’s systems or networks, or any systems or networks connected to the Site or to Joy o' Kanji. You may not forge headers or otherwise manipulate identifiers in order to disguise the origin of any message or transmittal you send to Joy o' Kanji on or through the Site or any service offered on or through the Site. You may not pretend that you are, or that you represent, someone else, or impersonate any other individual or entity. Joy o' Kanji’s obligations, if any, with regard to its products and services are governed solely by the agreements pursuant to which they are provided, and nothing on this Site should be construed to alter such agreements. Joy o' Kanji may make changes to any products or services offered on the Site, or to the applicable prices for any such products or services, at any time, without notice. Certain features or services offered on or through the Site may require you to open an account (including setting up a Joy o' Kanji ID and password). You are entirely responsible for maintaining the confidentiality of the information you hold for your account, including your password, and for any and all activity that occurs under your account as a result of your failing to keep this information secure and confidential. You agree to notify Joy o' Kanji immediately of any unauthorized use of your account or password, or any other breach of security. You may be held liable for losses incurred by Joy o' Kanji or any other user of or visitor to the Site due to someone else using your Joy o' Kanji ID, password or account as a result of your failing to keep your account information secure and confidential. You may not use anyone else’s Joy o' Kanji account at any time without the express permission and consent of the holder of that Joy o' Kanji account. Joy o' Kanji cannot and will not be liable for any loss or damage arising from your failure to comply with these obligations. This Site may contain links to other independent third-party Web sites (“Linked Sites”). These Linked Sites are provided solely as a convenience to our visitors. Such Linked Sites are not under Joy o' Kanji’s control, and Joy o' Kanji is not responsible for and does not endorse the content of such Linked Sites, including any information or materials contained on such Linked Sites. You will need to make your own independent judgment regarding your interaction with these Linked Sites. Joy o' Kanji does not promise that the Site or any content, service, or feature of the Site will be error-free or uninterrupted, or that any defects will be corrected, or that your use of the Site will provide specific results. The Site and its content are delivered on an “as-is” and “as-available” basis. All information provided on the Site is subject to change without notice. Joy o' Kanji cannot ensure that any files or other data you download from the Site will be free of viruses or contamination or destructive features. Joy o' Kanji disclaims all warranties, express or implied, including any warranties of accuracy, noninfringement, merchantability, and fitness for a particular purpose. Joy o' Kanji disclaims any and all liability for the acts, omissions, and conduct of any third parties in connection with or related to your use of the Site and/or any Joy o' Kanji services. You assume total responsibility for your use of the Site and any linked sites. Your sole remedy against Joy o' Kanji for dissatisfaction with the Site or any content is to stop using the Site or any such content. This limitation of relief is a part of the bargain between the parties. Joy o' Kanji reserves the right to do any of the following, at any time, without notice: (1) to modify, suspend or terminate operation of or access to the Site, or any portion of the Site, for any reason; (2) to modify or change the Site, or any portion of the Site, and any applicable policies or terms; and (3) to interrupt the operation of the Site, or any portion of the Site, as necessary to perform routine or non-routine maintenance, error correction, or other changes. Except where prohibited by law, in no event will Joy o' Kanji be liable to you for any indirect, consequential, exemplary, incidental or punitive damages, including lost profits, even if Joy o' Kanji has been advised of the possibility of such damages. You agree to indemnify and hold Joy o' Kanji and its officers harmless from any demands, loss, liability, claims or expenses (including attorneys’ fees), made against Joy o' Kanji by any third party due to or arising out of or in connection with your use of the Site. Joy o' Kanji may disclose any information we have about you (including your identity) if we determine that such disclosure is necessary in connection with any investigation or complaint regarding your use of the Site, or to identify, contact or bring legal action against someone who may be causing injury to or interference with (either intentionally or unintentionally) Joy o' Kanji’s rights or property, or the rights or property of visitors to or users of the Site, including Joy o' Kanji’s customers. Joy o' Kanji reserves the right at all times to disclose any information that Joy o' Kanji deems necessary to comply with any applicable law, regulation, legal process or governmental request. Joy o' Kanji also may disclose your information when Joy o' Kanji determines that applicable law requires or permits such disclosure, including exchanging information with other companies and organizations for fraud protection purposes. You agree that Joy o' Kanji may, in its sole discretion and without prior notice, terminate your access to the Site, for cause, which includes (but is not limited to) (1) requests by law enforcement or other government agencies, (2) a request by you (self-initiated account deletions), (3) discontinuance or material modification of the Site or any service offered on or through the Site, or (4) unexpected technical issues or problems. Joy o' Kanji administers and operates www.joyokanji.com from its location in Berkeley, California, USA. If you choose to access the Site from outside the United States, you do so on your own initiative and you are solely responsible for complying with applicable local laws. Any feedback you provide on this Site shall be deemed to be nonconfidential. Joy o' Kanji shall be free to use such information on an unrestricted basis. How Can You Stop Receiving Emails From Us? If you do not wish to receive additional emails from Joy o' Kanji, simply follow the instructions at the end of any email. You may be asked to provide your personal information anytime you are in contact with Joy o' Kanji. Joy o' Kanji may also combine it with other information to provide and improve our products, services, content, and advertising. Here are some examples of the types of personal information Joy o' Kanji may collect and how we may use it. When you create a Joy o' Kanji account, we may collect a variety of information, including your name, mailing address, phone number, email address, contact preferences, and credit card information. When you send Joy o' Kanji gift certificates, Joy o' Kanji may collect the information you provide about those people, such as the name, mailing address, email address, and phone number. We may also use personal information for internal purposes, such as auditing, data analysis, and research to improve Joy o' Kanji’s products and services. If you enter into a contest or similar promotion, we may use the information you provide to administer those programs. If you want to disable cookies and you’re using the Safari web browser, go to Safari preferences and then to the Security pane to disable cookies. For other browsers, check with your provider to find out how to disable cookies. Please note that certain features of the Joy o' Kanji website may not be available once cookies are disabled. We use this information to understand and analyze trends, to administer the site, to learn about user behavior on the site, and to gather demographic information about our user base as a whole. Joy o' Kanji may use this information in our marketing and advertising services. In some of our email messages, we use a “click-through URL” linked to content on the Joy o' Kanji website. When customers click one of these URLs, they pass through a separate web server before arriving at the destination page on our website. We track this click-through data to help us determine interest in particular topics and measure the effectiveness of our customer communications. If you prefer not to be tracked in this way, you should not click text or graphic links in the email messages. Joy o' Kanji shares personal information with companies who provide services such as information processing, extending credit, fulfilling customer orders, delivering products to you, managing and enhancing customer data, providing customer service, and conducting customer research or satisfaction surveys. These companies are obligated to protect your information. It may be necessary − by law, legal process, litigation, and/or requests from public and governmental authorities within or outside your country of residence − for Joy o' Kanji to disclose your personal information. We may also disclose information about you if we determine that for purposes of national security, law enforcement, or other issues of public importance, disclosure is necessary or appropriate. We may also disclose information about you if we determine that disclosure is reasonably necessary to enforce our terms and conditions or protect our operations or users. Additionally, in the event of a reorganization, merger, or sale, we may transfer any and all personal information we collect to the relevant third party. Joy o' Kanji takes precautions — including administrative, technical, and physical measures — to safeguard your personal information against loss, theft, and misuse, as well as against unauthorized access, disclosure, alteration, and destruction. Joy o' Kanji uses Secure Sockets Layer (SSL) encryption on all web pages where personal information is collected. To make purchases from these services, you must use an SSL-enabled browser such as Safari, Firefox, or Internet Explorer. Doing so protects the confidentiality of your personal information while it’s transmitted over the Internet. When you use some Joy o' Kanji products, services, or applications or post on a Joy o' Kanji forum, chat room, or social networking service, the personal information you share is visible to other users and can be read, collected, or used by them. You are responsible for the personal information you choose to submit in these instances. For example, if you list your name and email address in a forum posting, that information is public. Please take care when using these features. You can help ensure that your contact information and preferences are accurate, complete, and up to date by logging in to your account. For other personal information, we make good faith efforts to provide you with access so you can request that we correct the data if it is inaccurate or delete the data if Joy o' Kanji is not required to retain it by law or for legitimate business purposes. We may decline to process requests that are unreasonably repetitive, require disproportionate technical effort, jeopardize the privacy of others, are extremely impractical, or for which access is not otherwise required by local law. We do not knowingly collect personal information from children under 13. If we learn that we have collected the personal information of a child under 13, we will take steps to delete the information as soon as possible. This feature is meant to block spammers. Test Yourself on the Vocab in this Essay!